A self-propelled feeder is a serious investment, but for one new beef unit Keenan’s 345SP is offering several management benefits, as well as streamlining the job. The requirement to offer consistent, high quality, traceable rations as part of a high-tech production system has led former veterinary surgeon Rob Drysdale to invest in the first Keenan self-propelled diet feeder in the UK for his StraightLine Beef enterprise. After taking up the tenancy of a former store cattle unit in October, Mr Drysdale has invested significantly in the Winterwell Beef Unit near Shepton Mallet, upgrading the existing sheds to meet the needs of the intensive system. Calves are reared from 10-14 days old, and raised in small groups, with the aim being to graze where possible and grow on a predominantly grass-based diet. Cattle are finished indoors for the last 90 days. The cattle are kept in batches with yards divided into smaller pens, managed according to age, weight and fed specific rations. The farm grows in excess of 5,000 tonnes of its own forage each year. He says: “We make three silage cuts a year, at 35 per cent DM, 11 per cent ME and 17 per cent crude protein. 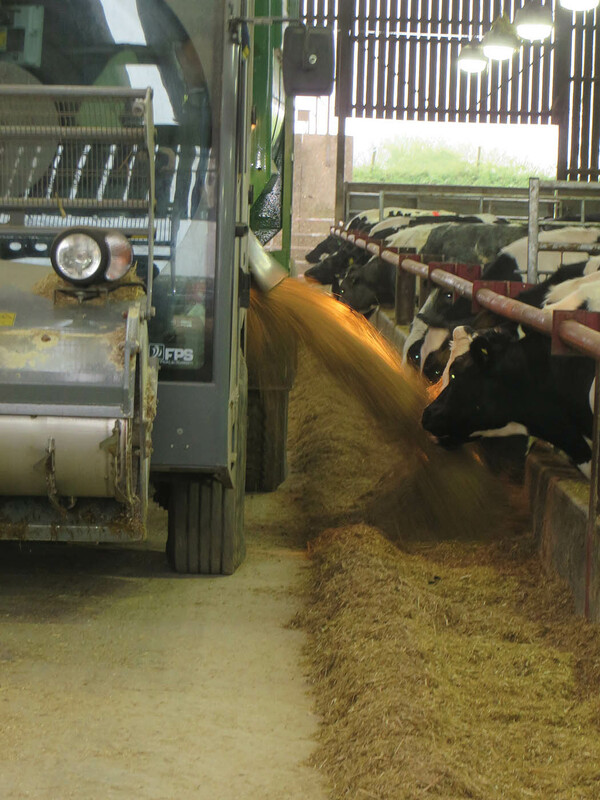 Purchased feeds include crimped maize from a local grower, a 33 per cent protein blend from KW Feeds and 250kg per cow of calf nuts, plus machine ground straw and a moist blend from KW based on brewers’ grains. Diets are tailored further to each animal, with native breeds getting a more forage-based ration than the black and whites, which switch to high cereal rations at 400kg. It is the feeding of bespoke diets to small groups of cattle which drew Mr Drysdale to the Keenan horizontal paddle system, which was already in use under the previous management in a trailed machine he inherited during the changeover. “Paddle machines seem to have gone out of favour, but I believe they produce a really good quality, consistent mix, especially on smaller loads,” he explains. The feeder’s ‘tub’ comprises a horizontal shaft featuring six paddles. These work against fixed knives mounted in the bottom of the machine. Like the trailed version, feed is then discharged via an auger, in a separate side chamber running parallel to the main tub. “This discharged feed is fed out using a conveyor at the front of the machine. “We always planned to purchase a self-propelled feeder wagon, as I believe its benefits outweigh the investment required, and a loan machine from Keenan arrived in November before the new 345SP was ready in March,” he says. With an interest in a farm in Estonia which uses a vertical auger self-propelled machine, Mr Drysdale was already conversant with the benefits of self-loading. The Keenan feeds nine loads per day, and farm manager Steven Barbour reckons it saves an hour a day compared to a trailed machine of the same capacity. Mr Drysdale says: “Over a year, the running costs for a loader and tractor mount up. “To run a high capacity vertical auger trailed machine we would need a large tractor which would otherwise stand idle as we use contractors for field work. By using a self-propelled feeder, we also save hours on our JCB loader as well as freeing it up for scraping, mucking out and bedding up. “The milling head is a very important part of the system as we have several fields contributing to each clamp. Three cuts of silage are taken and, although we aim for consistent forage, it is impossible to avoid narrow seams of variable grass. “I was concerned that using a block cutter would mean a variable diet fed each day, but a milling head takes a shallow depth of material from the full height of the face, so it is more consistent. “There is the risk of blocking the milling head and conveyor, but the Keenan rotor can reverse to clear any blockages. Mr Drysdale adds plans are afoot to exploit the consistency offered further by adding an NIR sensor to the head to measure yields as the forage is collected, recording and processing this data on Keenan’s InTouch control system. “This level of detail is more commonly applied to dairy cattle, but that is the approach that we are aiming for,” he comments. The new model benefits from the manufacturers latest InTouch terminal technology, which is quicker and more efficient to use, saving Mr Barbour an additional 20 mins a day. With a rigid chassis and 3.98m wheelbase, Mr Drysdale comments that the cab can feel a long way from the wheels. “We have had to get used to it,” he says. Mr Barbour says the feeder has performed well, but needs practice to get the best out of it. He says: “When taking forage at height it is easy to blow it into the front of the barrel and block it up. “There is plenty of power and it is very efficient at mixing. I shut the revs down when not feeding to save fuel. 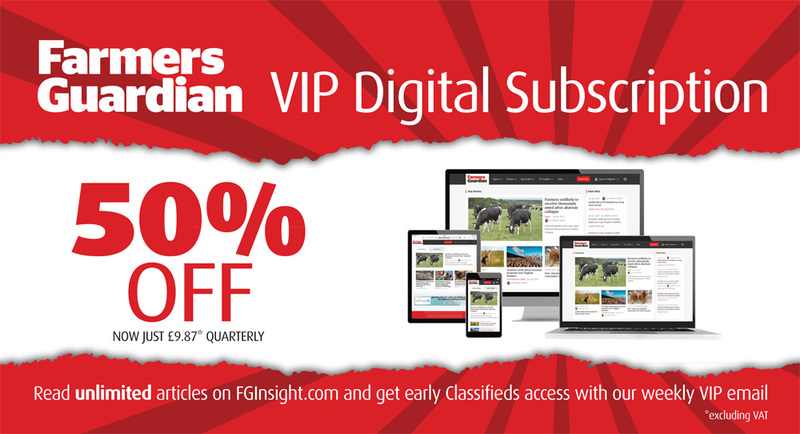 FANCY UNLIMITED ACCESS TO FG ARTICLES? CLICK HERE! “The diesel tank is quite small, but I only fill it up three times a week and it can be feeding for three hours a day. “I have found it surprisingly manoeuvrable, and the rear view camera comes in useful. Although the barn is a recent build, it is tight in places for modern machinery and you would do it differently on a greenfield site. The discharge conveyor can work to either side, but Mr Barbour tends to feed on the cab side to closely monitor the feed-out. The machine has been supplied with a full warranty and service contract over a four-year term. “Another benefit of the self-propelled type is that it has a high resale value due to the demand for second hand machines – I have already been quoted some 35-40 per cent of the original cost at four years old,” says Mr Drysdale. Keenan has worked with local dealer Smarts to train a service technician in the specialist requirements of the machine and back-up includes a replacement feeder if needed. “In reality, the only parts likely to go wrong are the milling head and the conveyor, so we could always load it with the JCB and carry on feeding. “That said, we did have an AdBlue pump go down on the demo machine over Christmas. The part came from Iveco in Italy and we were back up and running in two days, and now they keep the pump in stock in the UK,” says Mr Drysdale, emphasising that in a similar way to a milking parlour, the operator of a diet feeder needs the dealer to be close at hand for peace of mind. 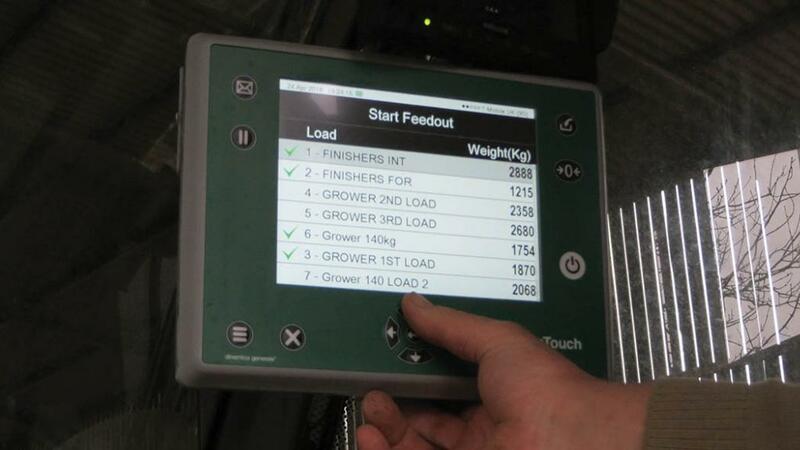 The in-cab InTouch controller is connected via the internet to Keenan’s InTouch monitoring software, recording and communicating ingredient weight, diets, rotations, mixing speed and mixing accuracy. The company monitors the information for troubleshooting purposes, and can provide live feedback and support, including nutrition advice if required. Mr Drysdale also works closely with a number of independent nutritionists who help him to source the best products from his suppliers, and this data can all be incorporated into the system. Keenan also offers a wider data service comparing results from other herds and systems and Mr Drysdale says that while this is of interest, he believes in comparing apples with apples, so data from similar animals would be of greatest interest. “We are looking to measure performance more accurately with the help of KW and Wynnstay,” he says.